Back cover blurb: In Nazi-occupied Holland, seventeen-year-old Noa snatches a baby from a train bound for the concentration camps, fleeing with him into the snowy wilderness surrounding the train tracks. Passing through the woods is a German circus – a troupe of waifs and strays, led by the infamous Herr Neuroff. They agree to take in Noa and the baby, on one condition: to earn her keep, Noa must master the flying trapeze – under the tutorage of mysterious aerialist, Astrid. Soaring high above the crowds, Noa and Astrid must learn to trust one another…or plummet. But with the threat of war closing in, loyalty can become the most dangerous trait of all. 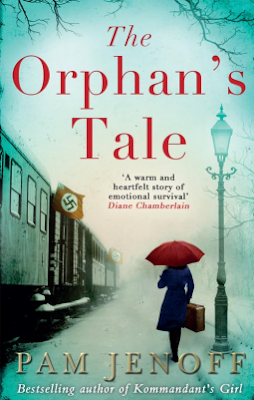 The Orphan's Tale is a WW2 novel with a little bit of a different perspective to the usual of its genre. That of Astrid (Ingrid) and Noa. A Jew and a Dutch refugee both fleeing from the horrors of the war around them. Having left her Nazi Officer husband (upon his orders), Ingrid returns to her home town to find her family gone. Herr Neuroff agrees to recruit her, his famous circus was once the arch rival of her family's troupe, but now they have gone, Ingrid has no one. Renaming herself Astrid in attempt to convince herself that her new life will be better, she throws herself back into circus life. When Noa appears with a baby in tow, Astrid is reluctant at first to help the young woman. Noa herself has a tragic past. An affair with a Nazi soldier and a resulting pregnancy saw her cast out of her family home. But the baby she now carries with her is not her own, and she knows that each day she looks after him, the danger grows. If Noa is to stay with the circus then she must learn the trapeze. It is second nature to Astrid, and she is at first impatient and unkind to Noa. Until a close encounter with some Nazi officers brings the two closer together. Both realise that they have secrets to keep, which must be kept in order for them to remain safe. The two slowly become friends, and look out for one another as the Circus makes its way out of Germany into France. It is here that it becomes clear that no matter how careful the circus are those acts that are hiding something amongst the greasepaint and the animals all have something to fear. The occupied country is a dangerous place and the Circus can't leave town soon enough. But is leaving France the answer? Very soon both Noa and Astrid will have their friendship and loyalties put to the test, as the fight to survive the War becomes tougher for those who do not fit in with the Nazi regime. The Orphan's Tale is available via Amazon online.